Warehouse and rack labeling activities account for a small number of total warehouse costs, but they can have a significant impact on operations. Without proper facility labeling, it’s nearly impossible to track inventory movement in and out of the facility accurately. A dynamic inventory mix or the frequent introduction of new equipment or racking can make warehouse labeling even more challenging. Warehouses and distribution centers have seen significant increases in SKUs and inventory volumes over the past decade, thanks in part to the rise in ecommerce activity. Demand for rapid order fulfillment means that pick/pack operations have to be even faster. To meet those requirements, warehouses have had to become more flexible when it comes to rapidly changing inventory locations and adjusting inventory to accommodate shorter demand cycles. Warehouse operators need to maximize space utilization and improve picking efficiencies as much as possible. With e-commerce growth, and the expanding footprint of warehouses and distribution centers to help meet rapid shipping expectations, the use of warehouse and rack labeling is increasing. The National Association of Manufacturers further reports that the majority (88.7%) of U.S. manufacturers are more optimistic than they’ve been in the 20-year history of the survey. As production expands, the need for accurate, reliable barcode labeling will only increase. As a result, pallet location and rack labeling will change much more frequently. Labeling solutions have to accommodate these rapid changes — no one wants to manually scrape old barcode labels off the same rack multiple times per month. Location labels can’t be an afterthought; without a plan for clearly labeling locations in a way that makes it easy to accommodate change, warehouses could wind up degrading their productivity. Emerging warehouse/rack options include label holders (which allow users to quickly swap labels without worrying about adhesive), labels that can be placed on top of existing shelf/rack labels to cover up the old information, and quick-release label products that can help eliminate the cleaning and scraping associated with removing old labels. In facilities where inventory and rack locations change frequently, durable magnetic labels are another option. Understand that your application requirements will change. Just because you’ve selected a printer/label/ribbon combination that does the job today doesn’t mean it will still work well a year from now. Customer requirements or production processes may change so that labels may be exposed to different operating environments or contaminants. Label stock may be discontinued or reformulated. Printer upgrades also require taking another look at consumables. Periodically re-evaluate your labeling products and make sure they are still performing as expected. Examine the end-to-end life of your labels to find ways to improve performance or add value. Work with your suppliers and vendors to find the best solution. More companies are putting their barcode labeling out to bid, but the lowest price isn’t always the best fit. Talk to potential vendors and suppliers about your label specifications and how to get the most value and best performance from their products. Custom and color labeling solutions are available. Color labels or labels that include logos or branding are easier to produce and could help improve warehouse label performance – location labels could be enhanced with color coding, or even supplier logos can help improve picking accuracy, for example. Thermal print solutions can be combined with custom pre-printed labels, color tags and labels, color-matched ribbons, and other customization options. Color barcode labels can also be used in a tiered racking system, which can improve inventory management, slotting, picking and other operations. For companies with multiple locations, that color-coding scheme can be used across facilities, making it easier to cross-train employees or shift labor resources when necessary. Printer supplies will continue to play a critical role in label operation performance. Using the wrong labels and adhesives not only affects the downstream performance of your labeling solution but also the performance of the printers themselves. Using the wrong labels and adhesives not only affects the downstream performance of your labeling solution (are the labels legible? Can they be scanned? Do they fall off? ), but also the performance of the printers themselves. Low-cost labels can damage printheads, resulting in costly repairs. As the universe of printer consumables expands, it will be essential to select supplies that will perform well and won’t cause printer maintenance headaches down the road. Advancements in label materials have provided better options when it comes to warehouse and rack labeling. New types of adhesives have made it possible to produce labels that can be permanent or removable, so users can easily discard or reposition labels quickly. There are also more durable label stocks that can be used on warehouse floors, or in environments where they are exposed to extreme heat, cold, or ultraviolet light. On-demand print solutions are emerging for businesses that experience rapid changes in product mix or shipping needs. Stand-alone and mobile on-demand printing systems can help with warehouse or rack labeling in facilities where product locations frequently change, or new products are often added to the inventory mix. These systems are cost-effective, don’t require much training, and can reduce integration requirements, while also improving efficiency by allowing employees to switch out labels without traveling back and forth to a stationary printer. 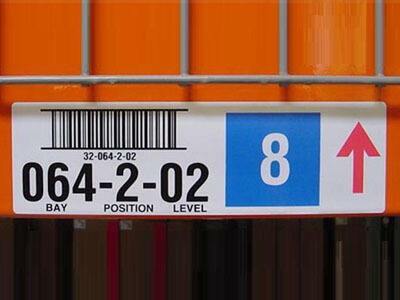 Warehouse rack labeling helps guide employees and inventory across a distribution center or warehouse. By leveraging new technology and advanced label materials, operators can improve label performance while also guaranteeing they have the flexibility to meet rapidly changing inventory demands. Contact an EMS Barcode Solutions barcode labeling expert via our website to learn more about how we can help your company stay ahead of the barcode evolution. We’re available via web chat, email or phone, and our friendly and knowledgeable staff is ready to assist you. Warehouse Barcode Scanners: What’s the Best Fit for Your Application? Get your free RFID ebook now to learn how this technology is transforming the way businesses manage inventory, merchandise — and people.